We recently hosted our first-ever APN Digital Summit with 20 sessions covering seven different AWS service areas. The all-day virtual summit gave AWS Partner Network (APN) Partners the chance to dive deep in areas that may be valuable to their business—from serverless to machine learning. The goal of the APN Digital Summit was to engage APN Partners in a fun, interactive, and educational event without having to leave the office. We also hosted a virtual GameDay for APN Partners to apply their knowledge of the services covered during the session tracks. Throughout the day, AWS Service teams presented on topics such as Amazon Elastic File Storage (Amazon EFS), Amazon QuickSight, AWS Systems Manager, AWS PrivateLink, Amazon GuardDuty, and more. They answered questions to give APN Partners a better sense of how to integrate these services into their AWS solutions or practice. The sessions ranged from introductory-level to advanced deep dives, meeting the needs of APN Partners at every level of their AWS Cloud Journey. On our new APN YouTube channel, you can watch some of our sessions from the APN Digital Summit. All of the sessions are available on APN Partner Central, and you can see the full list on the APN Digital Summit website. Software continues to become more pervasive, providing greater efficiencies, driving innovative ideas to market faster, and helping companies to better understand how to interact with their customers. Learn about the AWS Serverless Platform and how it’s helping companies unlock innovation potential, scale applications to meet the demands, and deliver significantly lower operational costs. Learn how to develop a blueprint for data flows in your organization—from data sources to data lakes, data warehousing, advanced analytics, and machine learning. We’ll look at how AWS services come together to build data pipelines and repositories for different use cases. Explore how to enable data science at enterprise scale in ways that unleash the value of corporate data, and embed AI/ML in business processes. With AWS PrivateLink, SaaS providers can connect directly with customers’ networks by providing solutions on private IP addresses rather than over the public Internet. Traffic that flows to the services you provide does so over private AWS networking, offering security and performance enhancements. AWS PrivateLink can also be used with AWS Marketplace, facilitating billing and providing a straightforward consumption model to your customers. AWS offers a variety of storage solutions appropriate for a broad spectrum of use cases. This session offers a comparison of AWS storage solutions, their benefits, use cases, and costs. Join our storage experts and explore the various AWS storage solutions and how to select the best solution for your business needs. As part of the APN Digital Summit, the AWS GameDay team held its first all-virtual GameDay and hosted the event live to APN Partners via Twitch. A select group of APN Partners were nominated to participate in the event, and each was asked to submit one team for the GameDay. This allowed participants to collaborate in-person and maintain a connection to the live stream event running on Twitch. AWS GameDay provides a gamified learning experience and exposes teams to real-world challenges and scenarios in a safe environment. GameDay provides a platform for participants to learn and get hands-on experience with AWS services in fun and interactive ways. Throughout the event, we saw AWS Partner Solution Architects stop by the set for fireside chats about AWS services such as machine learning, data lakes, Amazon Aurora, Amazon Redshift, containers, storage, DevOps and more. Hosts Trevor Hansen and Joseph Fontes, both Partner SAs at AWS, focused on keeping the audience engaged by discussing the GameDay challenges and communicating with teams on the live stream and Twitch chat. It was an exciting event, and we are excited for the next APN Digital Summit and GameDay experiences! Interested in Joining the Next APN Digital Summit? 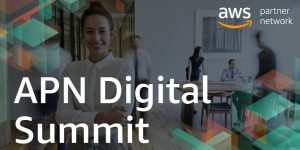 If you want to join our next APN Digital Summit, and have AWS services you’d like to learn about, sign up for our interest list and give us your feedback.